Political elections are always taking place somewhere around the world. Have a look through the tsunami of on-line media outlets and you’ll find many reports of elections which are about to take place or have just happened. Ever since man was clubbing animals for food, various people have put themselves out there as being the one who should lead their group and be in charge of the local cave, district, state or nation. So I was thinking a bit about this particular type of person, and wondering how I could create a cartoon on their evolution. I made notes of my thoughts as I pieced together a picture, and,,,,,,, well, , , it led to this instead of my usual cartoon. Something different. 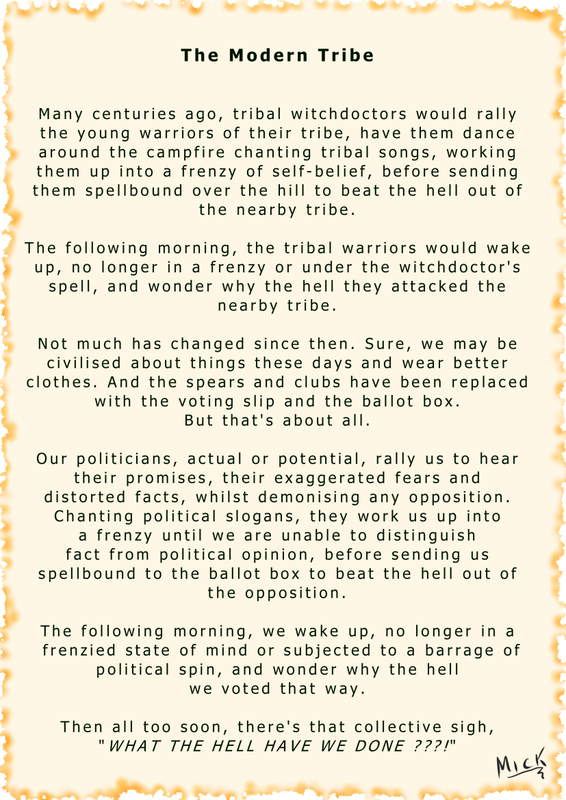 I hope you like it…..
Click on the image to enlarge, or use the Editorial/Political menu at the top of the page. Posted on July 31, 2016, in Cartoon, illustration, humour, humor, caricature, political, art, Australia, Perth, cartoonist, Illustrator and tagged Cartoon, election, elections, Government, humor, humour, Life, media, News, Political, politician, Politicians, Politics, promises, spin doctors, voting. Bookmark the permalink. Leave a comment.